Over the past few decades, amazing stories of underwater archaeology have made their way to mainstream media. We hear of a vast underground river system in Mayan Mexico, excavations at India’s Dwarka and Roman shipwrecks near the Greek Island of Naxos. One report in particular interested me in visiting Cuba. In 2001, a Canadian couple searching for wrecks on behalf of the Cuban government came across a group of strange geometric shapes on the ocean floor. This is the sea near the Guanahacbibes Peninsula and roughly in the strait between Cuba and Mexico. Pauline Zalitzki, a marine engineer, and her husband Dr. Paul Weinzweig found the sonar returns to be highly unusual. Rising abruptly from an underwater plain, they resemble an ancient city! 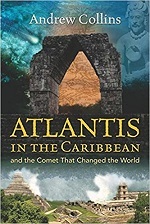 Plato places the existence of Atlantis closer to 10,000 BC. Needless to say, that’s at least a 40,000 year discrepancy! “What we actually found? Unusual images of submarine structures in the side scan sonar record. I examined offshore side scan sonar images of the US, Puerto Rico and Virgin island but found nothing similar… Is true that some of these blocks, of about 1 cubic meter size, have the pyramid, cubic and similar shapes, and sometimes can be aligned in a row. Are these ancient walls? We do not know… The most intriguing and shocking finding, indeed, is a square plate of grey color, about 1 cm thick, and about 12 inches side, protruding from a rocky wall, in one scarp, at several hundred meters deep. Unfortunately, the element was not sampled, but excellent images are available in video which I will post in the future. But now I have not idea what it is this “grey plate” or how it found it way to its present location. But the true is that this element do not look like something “natural”. Its nature remains unsolved… These are the facts. The question of what are these features at the sea depths remains open, and will require further investigations, very expensive because of the water depth and the equipment required. We can argue on its origin in one or other direction, but this mystery can only be resolved by an appropriate research.” (see https://www.youtube.com/watch?v=re_S_R40Wa4). Could civilization be much older than we think? Could there be an ancient and unknown civilization in the West Indies? Only 90 miles from Key West Florida, Cuba has a tumultuous history but also a paranormal past. The entire area of the West Indies and the Bermuda Triangle seem to be a hot spot for anomalous activity. Since childhood, I have heard stories of ships and planes disappearing, magnetic compasses spinning out of control, portals to other realities and UFOs buzzing the tropical airspace. (from an interview Castro gave to researcher Jose Luis Gil. Castro could not give an exact date – the sighting occurred sometime in the 1950s). And it’s not just the socialists either! Many US service men have reported bizarre stories of UFOs (or Underwater Submersible Objects, USOs in this case) leaving and entering the waters near Guantanamo Bay (for example, see http://www.openminds.tv/former-marine-describes-base-ufo-activity/36539). Could there be an underwater UFO base near Cuba? Who are the UFO/USO pilots? 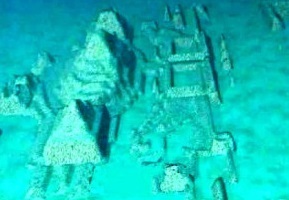 Regarding the nearly half-mile deep Zalitzki “mega” site, oceanography professor Robert Ballard has commented, “that’s too deep, I would be surprised if it were human” (see https://en.wikipedia.org/wiki/Cuban_underwater_city). Could the site be non-human ruins? It makes me think of the James Cameron sci-fi film, The Abyss, where oil rig workers assist Navy Seals in a nuclear sub recovery operation and run into “aliens” under the sea. Or maybe, the “non-humans” are something Lovecraftian (more on that later!). Using Google Earth, Jes Alexander says his team think they have also spotted an underwater city in the Western Caribbean! Jes explains, “this has nothing to do with another site, found almost 10 years ago by a Canadian/Russian team working to map the sea floor near the Yucatan Peninsula. Their site is nearly 2 miles below the sea floor…”(editors note: the correct figure is actually 600-750 meters or approximately just under a half mile deep). “…The site we are working with is much shallower – in between 40 and 70 feet of water” (ibid). Who were the original Cubans? Was Collin’s Atlantis or the island seeded or guided by an older, now “hidden” civilization? I also wondered if there might be a connection between the ancient Maya and Cuba. 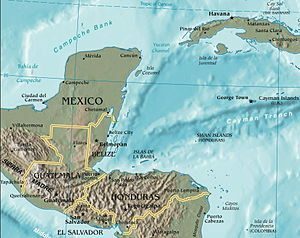 The channel between Cuba and the Mexican Yucatan is less than 130 miles. Over the past few years, I traveled to Cuba multiple times (and visited the Yucatan – see the Mayan Coastline Post) to investigate the various mysteries. Lacking the deep sea submarines, sonar equipment and trained personnel, I was unable to confirm the existence of an underwater city but what I encountered was remarkable just the same.